Every Thanksgiving, we all look forward to that special moment when the last dish is finally laid out on the table and family and friends are all gathered around in anticipation of the coming feast.Each year some major preparation and a lot of hard work goes into making this special moment possible. Since Thanksgiving is a time for giving thanks, this year help your child give a heartfelt "thank you" to your family's chef with a colorful hand-print apron and teach him the importance of giving thanks to those he loves. All you need is some simple craft paint, a canvas apron, and a little hand. Encourage other kids to participate for a little collaborative fun. A word of caution: this activity, adorable though it is, has the potential to create a very large mess. It's best to do it in a room that can get a little dirty, like the garage or the backyard. Even then, make sure you spread a drop cloth or plastic sheet over your work surface and have a bucket of soapy water and a pile of rags handy for washing paint from little hands. Lay out the apron on your work surface so that the bib can be reached easily. 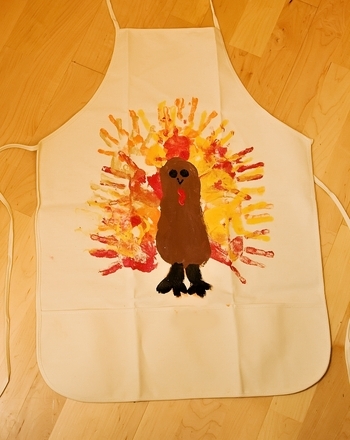 Have your child and any other children who want to participate create a “handmade” turkey on the bib of the canvas apron: starting with the largest child, paint one of his hands (palm and fingers) with one colour of paint, then have him press his hand firmly onto the centre of the apron bib. Invite the next child to place a handprint on the bib in a different colour. 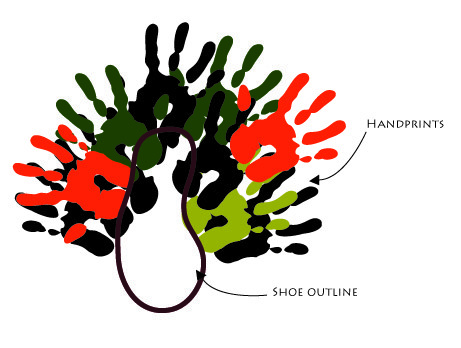 Have him place his palm over the first handprint with his fingers turned slightly to the side so that the fingers of the handprints do not overlap. Have each child take a turn placing a handprint on the apron until the turkey's feathers are complete. If only one child is participating in the activity, have him make all of the prints, making sure to rinse his hand between each one. Have all participating children clean their hands by washing them in the soapy water and then rinsing them in the plain warm water. Use your blow dryer to dry the paint. Invite the kids to help you paint in the traced head with brown paint. Paint in a beak and waddle with red paint, and draw eyes and feet with the black fabric marker. Give your apron plenty of time to finish drying—we recommend at least 12-24 hours—and then wrap it up for the big day. 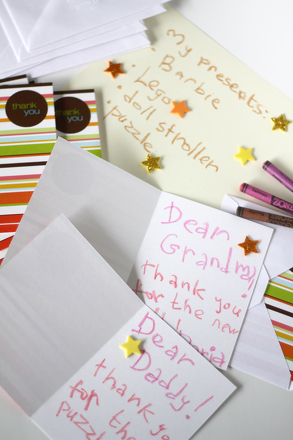 To include a little writing practise, have your child write a quick thank-you note to go in the package. This Thanksgiving is sure to bring not only full tummies, but warm and happy hearts as well! Thank you, dad, for all you do! Print out these cards for someone you love. Learn fun Thanksgiving trivia with this holiday quiz. Thanksgiving trivia questions teach you some interesting conversation starters for the dinner table. Craft a special Thanksgiving card for someone special this fall, or use this handy template to make cute invitations to the annual holiday feast! This Thanksgiving banner adds a festive touch to your house for the holiday. Create this Thanksgiving banner with your little artist this Turkey Day. Crown your Thanksgiving table with a turkey centerpiece handmade by your little one. This 'handy' Thanksgiving wreath gets your child to focus on things he's grateful for all year. Create a Thanksgiving wreath with your child this November. 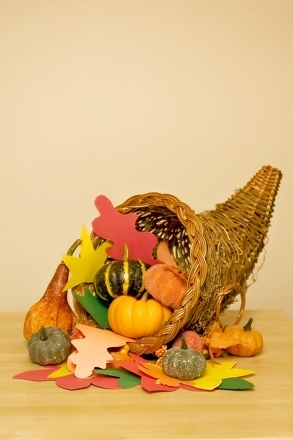 This Thanksgiving cornucopia activity will give you a nice homemade table decoration and will give your child a festive reason read, write, and give thanks.